"Vilja" Ghali Excellent Eureka and we went to another openshow for some practice. We met up with litter sister "Quita" Ghali Excellent Jade and brother "Djembe" Ghali Excellent Jaidan on the show ground. First out was me and Djembe. He did great, especially because he hasn´t been practising with me. Djembe behaved perfectly! The judge really liked him and his happy temperament he was placed as number one with Honoursprize! And today Quita was placed as number one with HP! Quita then got to compete against the best of breed winner in 6-9 months class and she won. Sister Vilja was placed on a wonderful 2nd place. All with honoursprize! Since I showed both Djembe & Quita, Karin (Saros owner) helped me to show Djembe in best of breed and I showed Quita. Quita won over her brother and become BOB & Djembe BOS! I couldn´t stay to the finals! So Anneli (Caspians owner) showed Quita in the group finals! Quita was placed on a wonderful 2nd place BIG-2! 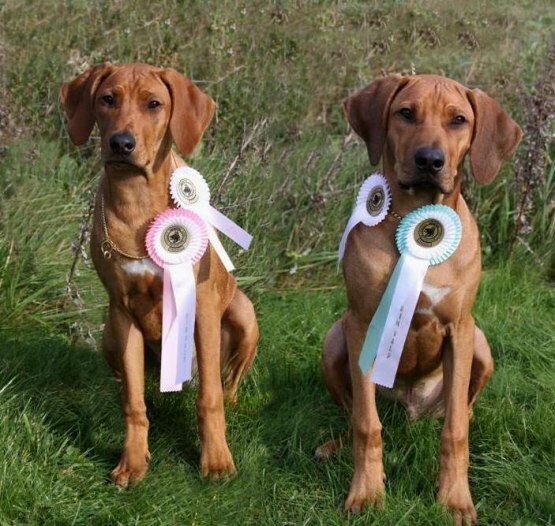 I have updated their showpage from the weekend: Quita, Djembe and Viljas At the same time Awenas daughter Cenna did great in the woods tracking with mum Helene! Brother Vilho in Finland also did great in the woods tracking. This past weekend My girls have met Aslas son Saros for a playdate at their favorite place!